Hi Karen! My name is Lynn A. Stokes and I am and have been either a private captain or a delivery captain since 1971 and I am the one that posted the referenced/forwared e-mail. Slight correction, it was posted on the Yahoo Beneteau 393 group, not the Puddle jummpers group. My mistake. I found your blog before you guys made the jump to SP as I was very curious about a couple cruising in a small boat! I am primarily a big boat capatain, 50 to 130'ers, although I have sailed smaller vessels, and was aware of Jim getting ready to head to NZ. That's why I had the be on the look out header. Also if you passed the info on to others about ready to make the trip,if they had enough crew and experience, the possibilty that someone could get this thing out of the way, may be advantagous to evryone. Either by scuttling or sailing it to NZ. I am also in agreement with you as I have the belief that you step up into a raft, not down. That said, I wasn't there nor were any of us that have been following this episode so we have no idea as to the pain or fear levels that kicked in. I'm sure most of us at one time or other, have had the crap scraed out of us to the point where you are looking for the majic button to transport you to a solid, warm and safe bar somehere! :) But we made it without pushing the button. I have had run across derilect vessels before, and as with all weird things that happen, at night! Why is that btw?!?! Anyway I was just passing on info that I thought might be helpful to all concerned. I couldn't agree more with your frustration. I personally think that who ever finds Windigo should scuttle it on principle. I know I wasn't there but if one does not have the ability to assess a situation when under pressure the sea is probably not the place for them. We got the crap beat out of us off Cape Blanco while heading up the coast. When we made port I was relating our experience to a cruising friend and he said. 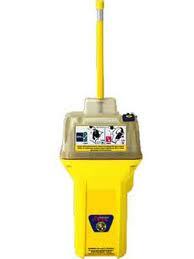 "You know, a lot of people would have activated their EPIRB in your situation". I was shocked, as uncomfortable as we were, I had assessed the situation to determine if we were in any real danger and we weren't. I am glad we went through it on our own, it made us better sailors. Wow! I cannot imagine abandoning a boat and then just waiting for someone to find it in daylight and fetch it back. It does not sound like it rolled, it was just tossed around a lot and bumped them a bit and they threw in the towel. I guess the kind of person to leave a hazard out on the water without lights is exactly the same person who heads out into a storm. Karen here. Normally I refrain from criticizing someone else's seamanship or what appear to be questionable decisions, except in private, because nobody who was not present at the critical point can speak with any authority. My "rant," which is what it may seem to some, does present the evidence as gathered by news media and others, and questions outright only the wisdom of leaving a boat to drift in the path of others. Several near-collisions with floating debris at sea have taught me that while it's a big ocean, it can still happen. A log that fell off a ship in the Gulf of Alaska once banged into my boat's side at night and bent the prop, and I came within a few feet of hitting another one head-on in daylight at the bottom of a 15-foot wave trough. 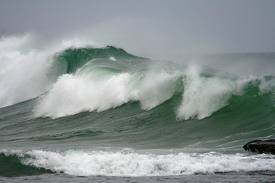 I would have surfed into it and likely sunk. Floating metal fuel bladders full of diesel have been passed within a quarter mile. Hitting a 37-foot boat at speed would likely seriously damage another boat and endanger the crew. If someone can sail this boat back to the owners it would be a kindness. But to go aboard a boat that's perfectly capable of being sailed back at this point to scuttle it would be wrong wrong wrong, and that was never the intent of this blog post, so let me be clear on that. I've read some online comments in a few sailing forums. This subject is so rarely raised and is so fraught with emotion that it's hard to have a rational discussion about it. It's one thing to say anyone who abandons their boat should scuttle it, and another thing to actually do it. But that doesn't change the fact that it would have been the right thing to do. This is an appalling story of people callously putting the lives of others at risk and abusing the privilege of support for everyone in distress on the high seas. The usual caveats apply of course, one wasn't there, one doesn't know the true circumstances. But one can't help thinking that this couple has exaggerated the case somewhat. Beneteaus are not especially robust and to survive a 360º, mast intact, sails neatly furled and rolled does seem fanciful. Then to leave the yacht afloat, unlit, a danger to shipping is unforgiveable. The only thing I can suggest is this. If anyone does come across it and manages to avoid it and if it might be possible to bring it into port, one could as the owners have asked, present it to them in return for the appropriate salvage fee. You would be perfectly within your rights. I do hate it when people are false and it does seem that these two are less than genuine. I agree with you 100% about being self sufficient and competent when going to sea. Back in 1974, My wife, Kitty, and I were on the last leg of a circumnavigation in our 30 foot Seawind Ketch, "Bebibka", when on July 14th we got hit with hurricane force winds of 85 kts and 30 foot seas midway between Cape Hatteras and Bermuda. We were late in leaving the tropics because I had had surgery only six weeks earlier and need to recover. At first we hove-to and then had to lie ahull due to the strength of the winds. In the middle of the night we fell off the top of a wave and when we hit the bottom, everything on the cabin top was blown off, including the grab rails and the main hatch. (we did not loose the mast; probably because thee was no sail up and we had re-rigged in NZ with galvanized wired three sizes bigger than the rigging we replaced. )When we righted the water inside the cabin was up to the level of the bunks. The boom was bent, the spray dodger was gone as was the windvane on the self-steering rig. We did not panic as that would have cost us our lives. Instead, I went to the task of securing a big piece of plywood (that had been over top of life raft which was in the cockpit) while Kitty bailed us dry using a waste basket. By the next day the wind had calmed down enough to set a storm trysail and continue on. We never considered abandoning the boat, although we kept looking at the life raft that was still in the cockpit and realized that we still had an escape if it came to that. The moral of the story is, "Don't abandon ship until you have to step up into the life raft and use proper storm tactics including heaving-to and/or lying ahull. I remember reading about the Queen's Day Storm that took many boats on the way from NZ to Tong or Fiji. It was no susprise that all the boats who hove to etc survived and the boats that were lost all were trying to outrun the storm. There are many other angles that the sailing public would find helpful. Lin Pardey is right, the crews who make quiet uneventful passages are seldom consulted because to use a metaphor, it's not the planes that land that make the news. I guess the contribution that a negative story like this can make is in the many ways we can all learn from it. I'm thinking about the possibilities, but they are far too many for one person to write about. Thank you Karen. Is anybody in contact with Adventure Bound? If anyone knows where they are or how to contact them I would be most grateful of the information. Or if preferred they could contact me, my email is duncan@duncanwells.com. As you point out it will be interesting to hear what they have to say. And as you suggest an article seems like a good idea. Apropos dangers to shipping we have just had a container ship Corvus J from Grangemouth (Scotland) bound for Antwerp (Belgium) heading SE collide with a car transporter Baltic Ace from Zeebrugge bound for Kotka (Finland) and heading presumably due north. Four crew dead at present. They collided in a busy shipping lane, sounds like the West Hinder TSS off the Dutch coast. The report said the Baltic Ace collided with the Corvus J and that may be so but if one was heading N and the other SE then the SE bound vessel was probably the give way (Corvus J) but as ever we were not there and we don't know. I wonder what the excuse will be? I wonder how this kind of thing happen with big ships equipped with radar, crew available for watches, and vessel traffic control? The history of maritime disasters has a lot in common with modern airline disasters; namely not one big mistake but a series of small escalating ones. Malcolm Gladwell has quantified and written eloquently on the subject of the latter. I emailed a friend on the same dock as Adventure Bound, and he forwarded your request for contact to them. Yes one wonders how it can happen? We will find out when the MAIB file the report. Thank you for passing the request on to your friend to ask Adventure Bound to contact me when they can. Michael Hawkins emailed me to say he would pass on my details to Bruce and Marcelle. Is Michael your friend, or someone else who has picked this up from your blog, I wonder? 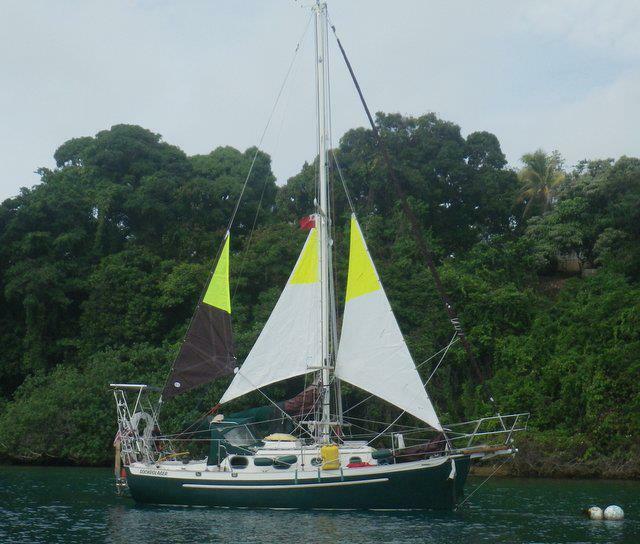 An update: Two NZ-bound yachts sailing from Tonga had encounters with Windigo. One, a small sloop sailed by a German singlehander, nearly collided with the derelict, and the other, a larger yacht motoring at night, ran over one of the long lines attached to the life raft that had been dropped to assist Windigo. The line wrapped around their prop, and they had to wait until daylight to go into the water to free it--no easy feat at sea. Duncan, we met Michael once in French Polynesia, but don't know him. The days of the Hiscocks, Smeetons, John Guzwell, and Peter Tangwald are long gone. Today, when standing in rising bilgewater, most "sailors" reach not for a bucket, but for a transmitter. I am a sailor whom have managed to do many of the mistakes possible over the years. And then I have done them again. And again. I have been the laughing stock of countless dockside judges, in many harbours. I still can hear faint echoes of their many ohs and ahs. And it continues; only yesterday a gentleman exclaimed "but that is [to lie ahull] dangerous", as a reply to my tale of a storm weathered. And I know he is perfectly right. It can be very dangerous. But when caught in the situation we do our best. Due to my vessel's characteristics I choose the lie ahull technique with myself locked into the cabin, as I knew the boat would be stronger than I, and because I'm a sucker for the comfort and comparable peace of a cabin when the vessel very slowly sails sideways leaving the slick that hopefully will protect my backside. But I am so used to the blushing and embarrassed stammering while searching for appropriate responses, that I do this every time, even when I might have done fine for once. But, it amazes me that I frequently have been, and am, a dockside judge myself. Many many many times. I simply love oh-ah-ing about the misfortunes of others, probably as this makes me forget myself and my many many shortcomings. I am a fallible person, sometimes I think even despicable, if other's despise I deserve. But now, here comes my moralisingly wagging index finger, the dockside judges have a new shotgun in their arsenal; the internet. It can be, and often is, a public whipping post on the village web. Thus the ohs and the ahs are not, as in the past, caught by the wind and blown to obscurity, but is, together with the names of the individuals involved and their vessel, preserved in perpetuity in the nerdy bosoms of many search engines. So please be gentle, and remember, as a breakable rule, let the guiltless throw first. Thank you, Eva, for your thoughtful comments. The beauty of sailing so many kinds of boats is that no one is ever overqualified to go to sea. There are many ways to solve problems, as you demonstrate with your success in lying ahull as a coping strategy in a storm. Perhaps your boat is especially suited for that where others aren't. If it works for you, it should be above reproach by others. A basic rule of seamanship as you know, is prudence, which means keeping out of trouble. If you can't avoid trouble, prudence still applies in every decision you make, including a responsibility to not put others in harm's way. The Windigo crew's decision to abandon their boat is not the main issue here; the decision to leave it to drift in the paths of others as a hazard to navigation is. I would not have written on this subject had Steve and Tania and their friends not posted prolifically in chat rooms and on people's blogs, such as ours. I would not have said a word had Jim not been asked to look for their boat, climb aboard and close the hatch, a breathtaking bit of hubris if there ever was one. Such actions were provocation, and this post was my response. It has evidently struck a nerve among many cruising sailors. The near-miss encounters with this derelict by two other boats at sea could not be considered "gentle." The not insignificant damage sustained by the crew of Adventure Bound, with no offer of reimbursement from the people they risked their lives for, could not be called "gentle." I'm sorry if strong feelings have made this seem like a whipping post, but the deliberate and imprudent actions of the Windigo crew put others in harm's way, and their subsequent broadcasts brought the spotlight upon themselves. Regardless of the context, this is a subject too often overlooked: how many of us have thought through what we'd do if we had to abandon our boats? I appreciate your most reasonable request to be more gentle. It's a good philosophy to live by. If everyone lived that way, this would not be an issue, because the Windigo crew would have done the responsible thing and scuttled their boat. As you on your blog are accepting comments from anybody is my call to you really about being aware of your editorial responsibilities, maybe even in the texts you yourself produce. Mostly sailing blogs are innocent and sometimes superficial diary notes about the experiences of people that for shorter or longer periods can afford to escape the daily drudgery by travelling into the sunset, as the uninformed seem to perceive the cruising life. But sometimes an issue can let loose a nastier and less generous side of the blogging community, as, to my mind, some of the above comments are examples of, regardless of what actions and motivations caused the anger. It is a fact that many sailors, including the ones that for different reasons turn out to be unable to cope adequately with stressful situations and danger, become inspired to make their dreams reality by reading blogs just like yours and also the works of famous writers like Lin and Larry Pardey, whom I mention because they themselves have written about this particular incident. By making the dream seem vital, and within reach, to the many lies also the responsibility of education, as the Pardeys certainly have done with their many articles, books, and videos, but also generosity in this public arena when lives are put at risk because the dreams have consequences that are easily overlooked when reading about sailing in the sunshine. It is my opinion that your anger would have been better served by writing directly to the individuals involved, and not by turning your pleasant blog into a public whipping post. We allow anyone who wishes to comment on this blog to do that. So far, except for a few spams or advertisements, all commenters seem to stay within reasonable bounds while expressing their opinions, some of which are admittedly rather pointed. Abusive comments would of course be blocked, but that has not happened so far. The community of current and future cruising sailors and friends who read this blog have diverse and sometimes strong opinions on matters of safety and seamanship, as they should. We do not plan to edit what they say. As for my own words, I stand by what I wrote in both the post and subsequent comments. The previous comment explains my reasons for broaching this topic in the first place. I am sorry if this offends you, but editorial responsibilities do not include limiting content if that content is pertinent to the lives of people out, or dreaming about, sailing in the sunshine. Asking a writer to do that would be just as inappropriate as asking a film maker with a reputation for controversy to limit her own projects. The responsibility of education includes rejecting superficiality and sometimes wading into areas where opinions differ strongly. I appreciate the insights you bring to this discussion, and thank you for bringing them up. Trusting the New Year finds you well. I can't imagine abandoning a boat that is not sinking and certainly not one with the rig intact. The safest place at sea (IMHO) is a floating boat ... safer certainly than a very small life raft. OTOH, if severely damaged and not navigable, removing the hazard to navigation by scuttling would certainly be the right thing to do. Hi. I found this blog on the internet but not sure if anyone reads or updates it anymore, anyway, heres my bit regarding Windigo. Dont you think that if it would be a danger to leave Windigo floating at sea the rescue services would have mentioned it at the time of rescue and done something about it. And after what the couple had been through for 3 days and nights in 50kt winds and 10 meter waves they were ready to be rescued. It may have been calm seas like you saw on the news reports, but when the rescue started it was the complete opposite. The boat may not have been sinking on the third day, but was very close to it on the first day, after a 360 roll, and in the dark. This blog is active, and this post has had more than 2,000 page reads. To answer your question, the crew was picked up by a cargo ship, not rescue services. First: Cargo ships are not obligated to do anything about the abandoned boat. It's my understanding that rescue services usually do sink abandoned vessels. The impression given to news media at the time of rescue was that the vessel was sinking. Second: Rescue services tracked the boat for quite awhile and broadcast its position, so it obviously was a concern to them. The pilot of the rescue plane did comment via VHF to the yacht standing by (whose crew later told us), that he wondered what he was doing out there on a rescue mission, because Windigo looked to be in near-perfect condition. Third: If you look at photos of the abandoned vessel taken by the rescue plane, and if you compare them with photos of other vessels that have actually rolled, you might come to the same conclusion that most of the crews who crossed that piece of water did: namely, how could any vessel do a 360 degree roll and come up with rig intact and gear still strapped to the foredeck? As stated in the blog post, Beneteaus are not known for their sturdy construction. This was a big topic of discussion. Most of the cruising community we know doubt that Windigo rolled, that it's more likely that she was knocked down, which is probably how her dodger got damaged. Fourth: No one is doubting the seriousness of the storm or the fact that the crew sustained injuries that could have been major, and no one could fail to sympathize with the utter fear they must have felt. A knockdown is very serious. What many seem to think, and several have told me I merely articulated what they have concluded, is that when you go to sea unprepared (no life raft, no spare bilge pump) and in a forecast where you know conditions will likely be very very bad, such as a developing tropical storm, then you have a responsibility to be self-reliant. If you can't do that and you have to call for help, you have a responsibility to not put others in harm's way. If you can do neither, then perhaps it's unwise to go to sea. Hi Karen. I know they were picked up by a cargo ship but the rescue was coordinated by the Rescue Coordination Centre New Zealand!! Why would the crew say the vessel had rolled when it had not. This couple had sailed many thousands of miles without previous problems, and when something like this happens everyone jumps to conclusions about what has happened without knowing any facts at all. They just assume what has happened. So if you were to do a journey a big as theirs and you had the same happen to yourselves and you had people posting things on blogs for everyone to read how would you feel. This couple had nothing to gain from this, they just lost everything,their home and all their belongings. And you mention of them knowing of the tropical storm, they did not.I think you have been reading too many forums. That is a very good question. Why would any crew say their vessel had rolled when it had not? If you had read the post and comments more carefully, you'd see that no conclusions were "jumped" to. It was a progression of facts as reported by both the crew themselves via radio, by media via the rescue services, and by conversations with other crews, one of which happened to have been on-scene. The photo taken by the rescue plane and published widely by news media shows a yacht in excellent condition, and no less than the owners themselves confirmed that fact via wide-ranging posts on forums and blogs. Google the words "capsized yacht" and look at the grim images of boats that have truly rolled, and then compare them with that photo taken by rescue services, of Windigo with intact sails and rig. Even the little triangle of furled genoa is still there. The question you raised is valid. That said, a knockdown is serious. Readers are entitled to make up their own minds as to what happened, and as someone who obviously holds the Windigo and its crew in the highest regard, you have a perfect right to believe what you wish. As I have made painfully clear throughout this blog post, anyone who abandons their boat under extreme circumstances has the complete sympathy and support of the entire cruising community. Everyone was praying for them during their ordeal. The criticism comes from, as I have repeated ad nauseum, the lack of regard for other sailors that they displayed by not sinking their boat after they abandoned it. If they did not know of the gathering tropical storm as you claim, then they violated a fundamental rule of seamanship and preparation. You don't go to sea, even for a short sail, without knowing the weather forecast. This was not a short sail. Good seamanship requires thinking ahead and being prepared, with backup plans. One can be sympathetic to another's loss without defending the indefensible. This story has faded from the news, but each time a new comment is made, our readers are reminded of it. 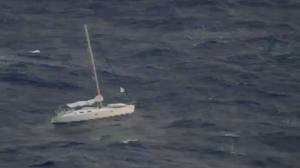 On March 17, the NZ Herald reported that the yacht had been "ransacked" on the Australian beach where it washed ashore.